A sublime dining experience is guaranteed at Belmond El Encanto. Playing host to some of the best restaurants in southern California, our passion for artisanal ingredients and exceptional flavors matches the region’s culinary abundance. Expect in-season herbs from our ocean-facing garden and fresh seafood caught daily from the shores below. Dine in our ambient dining room, or feast under the stars on the ocean-facing terrace. 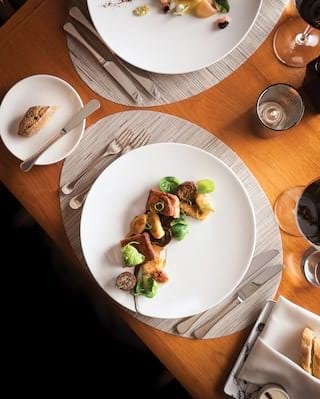 Either way, prepare yourself for superb gastronomy in one of the top restaurants in southern California. All ingredients are locally sourced and dishes crafted with seasonality in mind. Innovative coastal-inspired fare is complemented by peerless service and views worth traveling for. The Lounge is an ideal retreat for light dining or an elegant afternoon tea with friends. Delicately crafted breads and buns come filled with classic British combinations. Tempting scones, signature macaroons and buttery French pastries tempt any sweet tooth. Enjoy them outside with Pacific vistas. Reserve afternoon tea 24 hours in advance. Socialize and unwind in a laidback scene. Savor fine wines and gourmet bar snacks while learning Santa Barbara’s secrets from our warm bar staff. Santa Barbara restaurants can be beautifully polished or perfectly informal. At Belmond El Encanto, we invite you to enjoy both. In this lively laidback hub, meet old friends or make new ones over a selection of wines, spirits and inventive cocktails. For those seeking a light bite, American classics are reinterpreted on a gourmet bar menu. Dining at Belmond El Encanto is multisensory—our band treats your ears; our chefs, your palate. Complementing sublime ocean views and Chef Johan Denizot’s sensational menu, live music sets the scene seven days a week. Join us on Sunday, April 21 for a decadent Easter feast. Adults can enjoy bottomless Bellinis, Kir Royals and Louis Pommery Cuvée California’. Easter egg hunts will keep the little ones entertained while a live jazz ensemble sets the scene. What Sundays are made for. Indulge in bottomless Bellinis or Moët & Chandon Impérial Champagne, coastal cuisine and live jazz. Shared appetizers precede an à la carte menu of locally sourced favorites, including our popular Riviera Clam Bake. For something sweet, head to The Wine Room for an irresistible dessert buffet. Situated in The Dining Room, The Wine Room is a uniquely welcoming space that’s perfect for small, private celebrations. No matter what occasion you’re planning in Santa Barbara, venues at Belmond El Encanto are sure to leave a lasting impression.